JACKSONVILLE, Fla. - Family of the Arlington gas station owner who was wounded after he was shot during an armed robbery said they're relieved police have made an arrest. As of Wednesday night, Vipin Sharma, the 54-year-old man who was shot, was still recovering in a hospital. Sherwin Birt, 38, was arrested Monday and is charged with armed robbery and assault after the gas station incident. Sharma's stepson Veeral Rana told News4Jax he had never seen nor heard of Birt before his arrest. "At this point, we're just ecstatic that at least he's been caught and off the streets," Rana said. Investigators arrested Birt at an apartment complex near the BP gas station in Arlington. The gun believed used in the shooting was recovered from his girlfriend's home. 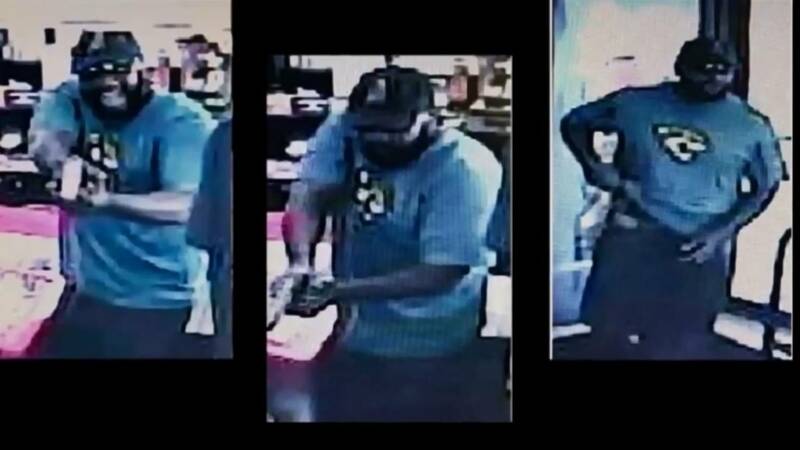 Surveillance photos released by the Jacksonville Sheriff's Office showed the moment Sharma was held up and robbed. Rana had a message for the man in those photos, who police say shot his brother. "I want him to reflect on what he did. You literally just harmed a family just for some money," Rana said. "Obviously we were complying. We were going to give you the money anyway. Why? Why would you want to harm someone like that?" Sharma is no longer in intensive care. Family said he is talking and eating. In addition to last week's robbery and shooting, police said Birt is charged with an aggravated assault and robbery on July 12 at Stars Rest Inn in Northwest Jacksonville, a robbery July 23 at the Avondale Superette and a burglary from last December.